grove with ­Jesus?” 27 Again Pe­ter denied it. And immediately a rooster crowed. they wouldn’t be allowed to celebrate the Passover. weren’t a criminal!” they retorted. 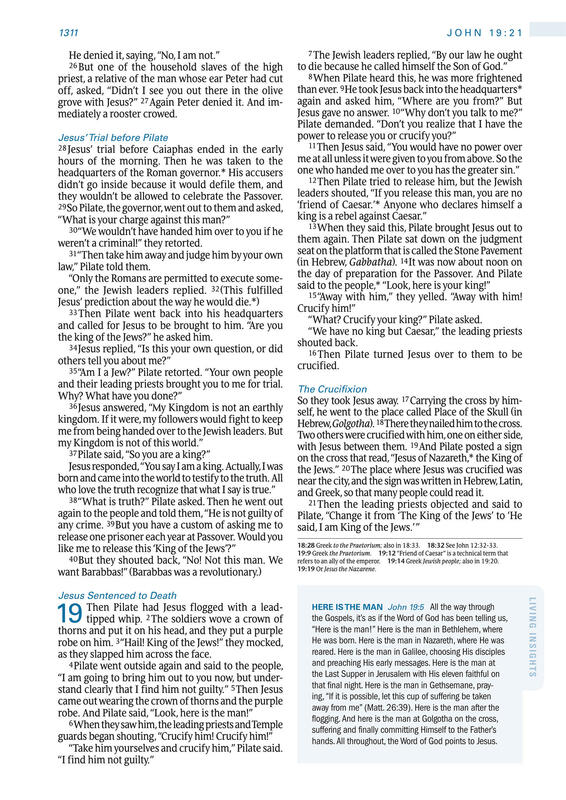 the king of the Jews?” he asked him. and their leading priests brought you to me for trial. as they slapped him across the face. “Take him yourselves and crucify him,” Pi­late said. ­Hebrew, Gol­go­tha). 18There they nailed him to the cross. and Greek, so that many people could read it. 18:28 Greek to the Praetorium; also in 18:33. 18:32 See John 12:32-33.
refers to an ally of the emperor. 19:14 Greek Jewish people; also in 19:20.
hands. All throughout, the Word of God points to Jesus. 15 “Away with him,” they yelled. “Away with him! “What? Crucify your king?” Pi­late asked.